Once again, I’m struck by what a brilliant idea it is to show kids history in graphic novel form. The frame of this series is pure fantasy. Our hero is Nathan Hale, the Revolutionary War spy. Somehow, I’m simply not surprised that he’s the hero chosen by the author Nathan Hale, who was born in 1976. Before the historical Nathan Hale’s scheduled hanging, there’s a silly sequence about how he comes up with his famous line, “I regret that I have but one life to give for my country.” When he does, a giant book with the title, The Big Huge Book of American History appears and swallows him whole. But then he comes back, having seen hundreds of years into the future of this country. But then, to prove he’s seen the future, Nathan Hale begins telling stories to the executioner and the British officer overseeing the hanging. They decide he can tell more stories before he hangs, which is the premise of the series. 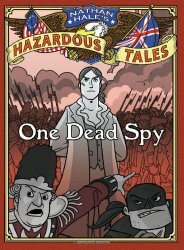 And the stories Nathan Hale tells are true, with plenty of invented dialog and put into comic book form. Did you know that Nathan Hale wasn’t actually a very good spy? He got caught on his first mission. But he was involved in some noteworthy exploits before he became a spy. I especially found interesting the way the cannons from Fort Ticonderoga got moved to liberate Boston Harbor, and the way General Washington had a fort built and moved into place in one night. Riots, massacre, starvation, fever, theft, spycraft, mercenaries, sea warfare, land warfare, lightning, exploding cows, and death by hanging. Do you know any school-age kids who can resist such a warning? It’s time for Sonderling Sunday! That time of the week when I play with language by looking at the German translation of children’s books. And my comments work again this time! This week, it’s back to my stand-by, the book that inspired me to start Sonderling Sunday, Der Orden der Seltsamen Sonderlinge, by James Kennedy, otherwise known as The Order of Odd-fish. Last time, we left off right around the halfway point, on page 208 in the English version, and Seite 262 auf Deutsch. Just to set the stage, I’m going to write out the whole first paragraph of this section. Jo and Ian searched the neighborhood, but they didn’t really know what they were looking for. It wasn’t clear what “Duddler Yarue” would look like, and anyway, the streets were almost deserted. After a half hour of wandering, Jo despaired of ever making any headway, and was ready to give up when they saw an effeminate boy smoking a cigarette on the corner. He watched Jo and Ian idly. Jo und Ian suchten das ganze Viertel ab, aber sie wussten nicht einmal genau, wonach sie eigentlich suchen sollten. Es war nicht klar, wie dieser »Duddler Yarue« eigentlich ausschaute, und außerdem waren die Straßen beinahe vollkommen menschenleer. Nachdem sie eine halbe Stunde herumgeirrt waren, glaubte Jo nicht mehr daran, dass sie noch irgendetwas erreichen würden. Sie wollte schon aufgeben, als sie einen etwas affektierten Jungen an der Ecke stehen sah, der eine Zigarette rauchte. Er beobachtete Jo und Ian gelangweilt. “I wouldn’t want you to miss it.” = Ich möchte nicht, dass du das versäumst. = Der kaufte drei Münzen und warf sie ordnungsgemäß in den Schlitz. And that’s it for tonight! A short one, but it’s nice to get back in the swing of it. After all, Ich möchte nicht, dass du das versäumst. Dark Horse Books, 2013. 106 pages. I didn’t expect to enjoy this graphic novel as thoroughly as I did. It’s made up of strips from a webcomic about a girl who’s a superhero. She can lift heavy objects and leap over tall buildings, but she can’t fly. In her ordinary life? She’s pretty ordinary. She’s a young adult in a small town that doesn’t have much crime. She’s got a roommate, and she has trouble paying the rent, because she really needs a day job. She has no tragic catalyst in her life that made her a superhero, and she’s always been in the shadow of her superhero brother, Kevin, who is everybody’s favorite and can fly and has corporate sponsorship and looks like a proper superhero. Superhero girl has some issues. She forgets to take off her mask sometimes when she’s trying to be an ordinary citizen. She goes to a party with her roommate, trying to set her work aside, and gets caught in the thrall of a supervillain who has the power to make everyone think he’s awesome. Then there’s the skeptic, who’s convinced she can’t be a superhero without a tragic back story or a fancier costume. And don’t get started on the time she washes her cape in the Laundromat and it shrinks. Superhero Girl is about life. It’s about being a younger sister, about being a broke roommate, about needing a job, being underappreciated, getting sick, feeling out of place at parties, being annoyed by people carping when you’re doing your best – all wrapped up in the package of being a young superhero in a small-market city where you’re pursuing your dreams but don’t seem to be getting anywhere. That’s not parody. There may be elements of parody on the surface, but really, that’s rich, human storytelling. 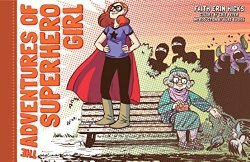 It’s telling the truth through humor, and using the trappings of the superhero genre to universalize it, to turn it into something symbolic, so we can all identify with it, maybe more than we could if SG was a paralegal or a barista or a surgical intern. The superhero stuff is the context, the package, and the humanity and emotion and the humor found in it are the content. The story. This is a story about a young adult starting out in life, pursuing her dream, and struggling to do so. It’s reading that will make you smile. I had wondered why I hadn’t gotten comments in months. (Duh!) My statistics had gone way down, too. It turned out that my comments table and my statistics log table were corrupted. The usual repair process didn’t work at all. So, now I have Good News/Bad News. I also want to note that Yahoo! Web Hosting was NO help at all. If I had it to do over again, I’d definitely choose a different host. They just said they provide a platform for MySQL and WordPress, but don’t provide any support for those. But I did decide that being able to comment in the future is more important than saving all the old comments for posterity, even though it makes me sad to lose them. Recorded Books, 2007. 8 hours on 7 compact discs. 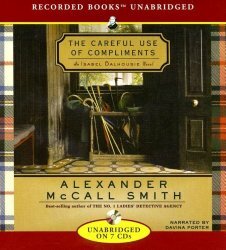 This is the fourth novel about Isabel Dalhousie by Alexander McCall Smith. I’m finding them much more enjoyable via audiobook. Isabel is a philosopher. She muses and thinks about everything that she comes across. In other words, the plots of these books are extremely slow moving. This is fine when you are in the car anyway, and delightful Scottish accents add to the fun. You’ll be disappointed if you expect a traditional mystery from these books, but Isabel does slowly encounter a puzzle about a painting she’s thinking of buying. Also in the book she explores questions about motherhood, as she has a newborn son, and about her relationship with Jamie, so much younger than she is, and her relationship with her niece Kat. She’s being cut out of her job with the Review of Applied Ethics, and has to deal with the plotters responsible. If you want an action-packed thriller, don’t pick up these books. But if you want to explore some musings about life and love with a deep thinker, and encounter some interesting situations at the same time, these books are a delight. Schwartz & Wade Books, New York, 2014. 36 pages. The girl in this book wants a pet. After much begging, her mother promises that she can have any pet she wants as long as it doesn’t need to be walked or bathed or fed. She gets a sloth. She names him Sparky. Sloths are said to be the laziest animals in the world. It is two days before the girl sees Sparky awake. She tries to play with Sparky. He’s not very good at Hide-and-Seek or Kung Fu Fighter, but he’s very very good at Statue. 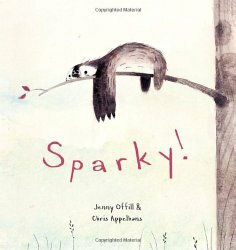 When another girl from school is critical of her pet, Sparky’s owner decides to present a Trained Sloth Extravaganza. Unfortunately, the only trick Sparky learns well is playing dead. Interestingly, this book doesn’t end with a big bang or a punchy lesson. But we close with the girl sitting in the tree next to Sparky. “You’re it, Sparky,” I said. And for a long, long time he was. This book makes me smile. I’m not proud to say it, but a poetry book has to be something special to wow me. Firefly July is stunning. The poems chosen have one thing in common: They are all short. They are also fit nicely into the context of a specific season. A few are well-known, and I’d heard of them in my childhood, such as “The Red Wheelbarrow,” by William Carlos Williams, and “Fog,” by Carl Sandburg. Several more were by poets I’d heard of, such as Emily Dickinson and Langston Hughes. But the majority were entirely new to me. Those, too, were short and sweet and lovely. 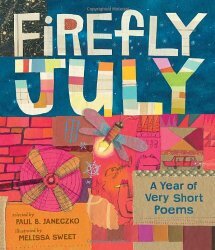 Of course, the fact that all the poems are short makes this perfect for young kids looking for their first poem to memorize. My petals enfold stamens of gold. in the coolest most delicious muck. Melissa Sweet’s artwork is hard to describe. There are collage elements and bright colors and unsophisticated line drawings and friendly faces. They work beautifully with the poems in this collection. Malista Press, Olmito, Texas, 2007. 245 pages. Years ago, through reading the books of George MacDonald, and through reading the Bible trying to put aside my preconceived notions, I came to believe that the Bible actually teaches that hell is not forever — that it has a redemptive purpose and will eventually be emptied out and every knee will bow to our loving Father. George MacDonald, however, while implying that this is what the Bible teaches, doesn’t lay out an argument of why he believes the Bible teaches this. Gerry Beauchemin, in this book, lays out an excellent argument. Gerry Beauchemin calls his view “The Blessed Hope.” I like that very much, and much better than “Universalism,” because I think it’s different than what most people think of when they hear “Universalism.” Yes, I believe in hell. But I believe it represents the lengths to which a loving Father will go to bring his children back to Himself. It is not purposeless, everlasting torment. Now, many Christians will automatically be arguing, “But that’s what the Bible says?” Is it really? I suggest you read this book and rethink that view. And I agree with the author that The Blessed Hope honors the character of God. God is good even in His judgments. They are not infinite and horrendously cruel, but just, righteous, and remedial. Many people don’t realize that the view that hell is eternal is not the one the church fathers held. I certainly didn’t realize that. Although this view is common today, it actually originated with Augustine, and so is called the Augustinian tradition here. First, the author presents the pillars of his argument. The first pillar is the meaning of the Greek word Aion, which is more consistently translated “age” than “eternal.” Interestingly, Augustine, who supported the “eternal” interpretation (which is not consistent with other usage), was one of the first church leaders who wasn’t a native Greek speaker. In this chapter, we have examined the foundational pillars upon which belief in infinite punishment is based and found them wanting. How many Christians including pastors and theologians have critically examined these pillars in light of the evidence presented here? I would venture to say very few. Given this evidence, let us explore with a fresh and open mind, unshackled by a flawed system and study the following chapters in sincerity and truth. 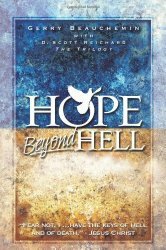 Is there hope beyond Gehenna and the lake of fire? Might these judgments also have a positive purpose in God’s unfailing plan for man? The answer lies in the very nature of God Himself. Would a truly all-powerful and all-loving Creator bring into existence billions of people knowing well they would suffer for eternity as a result? Would He really pay such a price to get a few to love Him forever? This is what our tradition has taught. Is it true? I’m not going to present all his arguments. Because I’d like people to consider them in full. I will, however, quote some paragraphs that I underlined in my slow savoring of the book. The longsuffering of our Lord “is” salvation. What a thought! When does the longsuffering of our heavenly Father for His children ever end? Does it end sooner than yours toward your children? The love of God expressed in His longsuffering will do what His brute power could never do — win the hearts of His enemies (Ps. 66:3-4) and make them His friends (Jer. 31:34; Jn. 15:15; Ro. 5:10). Why are we asked to pray for laborers for the harvest? Why are they needed? Doesn’t the text say it is because people are weary, scattered, distressed, and dispirited? But what has our tradition led us to believe? Answer: To pray because all people are on their way to hell! Isn’t there an inconsistency here? Is there any positive purpose to God’s Gehenna judgment? What purpose does it serve? According to the prevalent theology, its only purpose is to inflict pain. It refuses to acknowledge it has any remedial effect, and presents it merely as a perpetual prison from which its victims can never escape. I intend to show in this chapter the following facts: First, this view is simply unjust, and Scripture does not support unjust punishment of any kind. Second, Scripture affirms death is no obstacle to God in accomplishing His purposes in any life. Third, God is just and His justice satisfies even our God given human understanding of justice. Fourth, the Bible provides clear examples that all His judgments are driven by a positive purpose. Most of us are not aware of how powerfully our paradigms affect how we understand the Scriptures. They force us to conclude certain passages do not mean what they say. Unless we are keenly aware of this, and make a diligent effort to compare Scripture with Scripture, we cannot see truth staring us in the face. It has been a slow, hard process for me. But once I stepped out of the eternal hell paradigm and began seeing Scripture without that filter, I was freed to receive God’s revelation in a fresh new way. He looks at proclamations from Scripture, the Apostles, church fathers, logic, the character of God, and consequences. Is Christ really the Savior of the World? Scripture refers to Christ as the Savior of the World. In fact, “Jesus” means savior (Mt. 1:21). The Father sent Him as such (1Jn. 4:14). Though popular theology gives lip service to this title, it actually denies it. It attests instead that Christ is merely the Savior of “some out” of the world. Or again, He is the “wish to be” Savior of the world. If the mass of humanity is lost forever, call Him what you will, He is not the Savior of the world. It does not matter that few, many, or most of the world is saved. Even if none are saved, He would still be referred to as “Savior of the world.” For the reasoning is simple: to offer salvation, makes a savior. That is strange indeed — “The Savior of the world not saved.” What would you think of a lifeguard who was hailed as the hero of the day at the funeral of a young child for merely having offered her a life preserver and then threw it to the other end of the pool? The Blessed Hope and the Augustinian Tradition present two opposing views of God. Of these two ancient theologies, only the first does justice to the character of our glorious God as He is revealed in Christ. It is what the prophets, the apostles, and the early Church embraced. The second, on the other hand, is shackled by a theology of terror which I contend is the primary reason the Gospel has not yet taken the world by storm. Is it by coincidence that once it dominated the western church the medieval world plunged into the “dark ages”? I am by no means presenting all the arguments here. If this interests you at all, I strongly recommend this book. As for me? 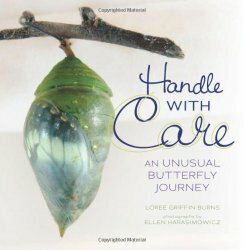 Reading this book filled me with joyful, blessed hope. Albert Whitman & Company, Chicago, 2014. 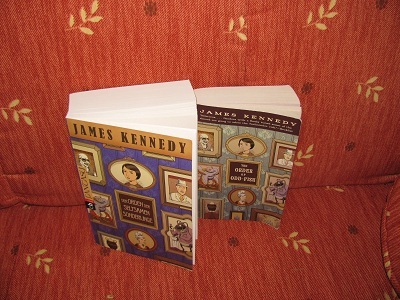 First published in the United Kingdom in 2012. 91 pages. This is the third beginning chapter book about animal-loving Lulu, and I like each one better than the last (having already been charmed by the first). 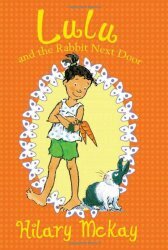 In Lulu and the Rabbit Next Door, Lulu gets new next-door neighbors, and they include a boy her age who has a rabbit. Lulu is excited about the rabbit, but the boy, named Arthur, is not. His grandfather gave him the rabbit, named George, when Arthur had asked for games for his Xbox. Arthur pays no attention to George except to feed him and check his water and clean out his cage. That was true. Lulu knew it was true because she and Mellie checked. They could see George’s hutch quite clearly from Lulu’s bedroom window. With Lulu’s telescope they could see George sitting inside. Twice a day, at breakfast time and dinnertime, Arthur visited George with food and water. Once a week on Saturday mornings, he put him on the ground, scooped all the sawdust out of the hutch into a black trash bag, and put in fresh sawdust. It didn’t take long to do this. The whole job was over in just a few minutes. During those few minutes George became a different rabbit. He would begin with hops. Then a stretch. Then he would begin to run. He ran faster and faster in a racing circle all around the little garden. Sometimes as he ran, he leapt, high into the air. He ran until he had to stop, panting so hard his sides went in and out. Then Arthur would pick him up and put him back inside his hutch. To sit there for another week. It was more than Lulu and Mellie could bear. Lulu gets to keep George for a week while Arthur and his family go on vacation. George makes friends with Lulu’s rabbit Thumper (the one who doesn’t get along with her other four rabbits). One after another, George gets notes that show Arthur how many interesting things a rabbit can do. It all culminates with a birthday party for Thumper that is almost stymied when Arthur has a hard time thinking of a present. This beginning chapter book even kept me entertained. My sister had a rabbit when I was a kid, and I certainly had no idea how many things a rabbit can do. And besides that, the interactions between Lulu and her cousin Mellie with Arthur, who doesn’t know what to make of the crazy animal-lovers, are lifelike and fun. I enjoyed Mellie’s idea for teaching Arthur to take better care of George – she suggested they should keep him in a cage for a week. Their eventual solution was ingenious and delightful to watch unfold. You are currently browsing the Sonderbooks blog archives for July, 2014.